Various boats on the way to Turtle Island. Colorful fishing boats and plants floating on the river. Approaching the Mekong Floating homes. Our 'home' on the Mekong. Bamboo in the material of choice in these parts. Dusk through palms and a small Jackfruit tree. 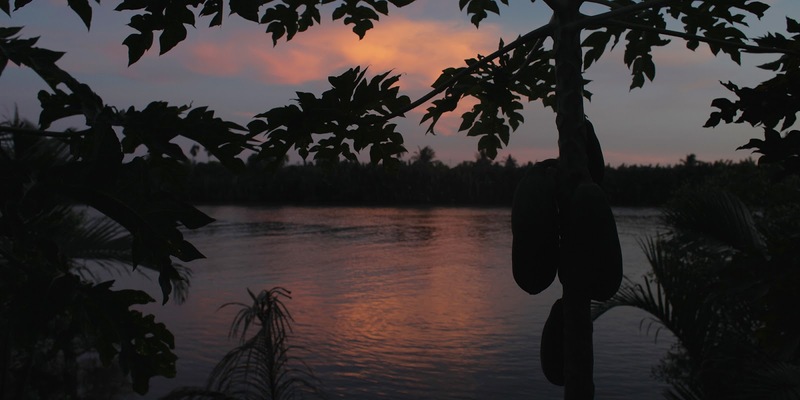 A full moon rises over the Mekong River. After Hoian, we skipped through Ho Chi Minh City / Saigon, and went straight to the Mekong River Delta. Our destination was the Mekong Floating House. 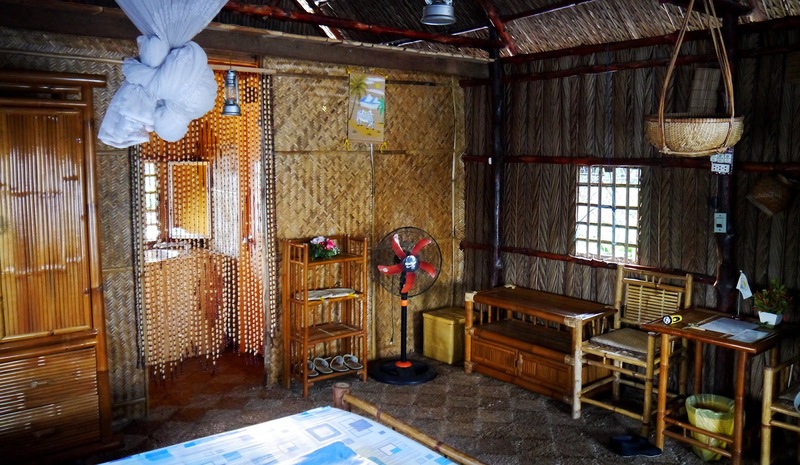 After a car, plane, taxi, bus, motorcycle and boat we were not disappointed to arrive at a collection of rooms, really truly floating on the Mekong. We arrived in time to watch a gorgeous sunset walking along the bank of the small Turtle Island. We returned to our room and enjoyed the set meal made by our French-Vietnamese hosts. We woke up the next morning, pleased we had chosen to sleep in the bug net. Our room was full of bees. Not full as in the air was thick with bees, but still, enough that we noticed all the buzzing immediately when we woke up. We cautiously crawled out of our cocoon to investigate, and realized that the bees seemed to leave us alone (Mostly. After sitting and eating breakfast, I reclined in a deckchair and suddenly felt a sharp pain on my left hip. I didn't see a stinger, or a bee, or a spider, but the bite was swollen, hard and painful for a couple days. I should have paid more attention to my surroundings in hostile territory I suppose). The bees eventually left, about the time that the breeze picked up on the river, around 11am. Unfortunately they left us with their old and infirm, so we had dead or dying bees spread around the room. Shoes on party! We were told that Mel Gibson stayed in our room (that means we have now shared a bed with both Adrian Brody and Mel Gibson on this trip) and didn't do anything for 5 days. I felt totally justified in reading and napping and eating and then reading and napping and eating. In fact, I prefer to think that we were actively floating on the Mekong, and that in and of itself is a pretty cool way to spend a day. We also busied ourselves watching the Mekong change direction. First it's flowing towards the ocean, then it gets very still, then it starts flowing up river for a while, with the winds following it, and then it gets still again and changes back. I understand tides of course, but when you wake up early in the morning and the river you watched last night is going the opposite direction and you are pretty sure you didn't drink that much the night before, it's a little disconcerting. We had to leave earlier than we would have hoped as it was "reunification day" and since people had a 4 day weekend the good busses were all full. We retraced our boat to the motorcycle to the bus to the cab and were again in Saigon.